GLOBAL - The industrial application of synthetic sources of amino acids for animal feed has been occurring for over 50 years. Chemically synthesized DL-methionine, 50 percent L-methionine and 50 percent D-methionine, was one of those amino acids added to poultry feed, writes Mercedes Vazquez-Añon, Senior Director, Animal Nutrition, Research and Facilities – Novus International, Inc. .
Methionine is considered an essential amino acid as it is not naturally created by the animal, and therefore must be consumed in the diet. Over the past 50 years, drastic improvements have been made in knowledge of required relationships between amino acids for optimal lean deposition and feed efficiency. More recently, isolated L-methionine, created through chemical and fermentation processes, has been made available to the market. However, considerably more research needs to be completed before claims of improved relative bioavailability can be confirmed. Additionally, application data is needed to support those research findings. It has not yet been determined if L-methionine has reliable product quality and supply to the market. Methionine exists in two forms, as D-methionine and L-methionine. While there is no difference in the chemical make-up of the two isomers, the configurations of the molecules differ. Methionine, like all amino acids, contains a central carbon atom with four groups branching out from it. In the case of methionine, these four groups consist of a carboxyl group (COOH), an amine group (NH2), a hydrogen atom (H), and an R group (C3SH7 for methionine). D-methionine and L-methionine differ in the three-dimensional structure formed by the groups around the central carbon. Enzymes are sensitive to the configurations of these isomers, and animals can only convert the L-methionine into protein. The methionine hydroxy analogue’s chemical structure is similar to that of methionine. It contains the carboxyl group, hydrogen atom and R group branching from a central carbon atom. However, instead of an amine group, the analogue has a hydroxyl group (OH) in its place. The analogue exists in both the D- and L-isomer forms. Commercial methionine and methionine hydroxy analogue produced by chemical synthesis produces both D- and L-methionine in an equal parts mixture. Commercial methionine produced by fermentation results in only the L-isomer. 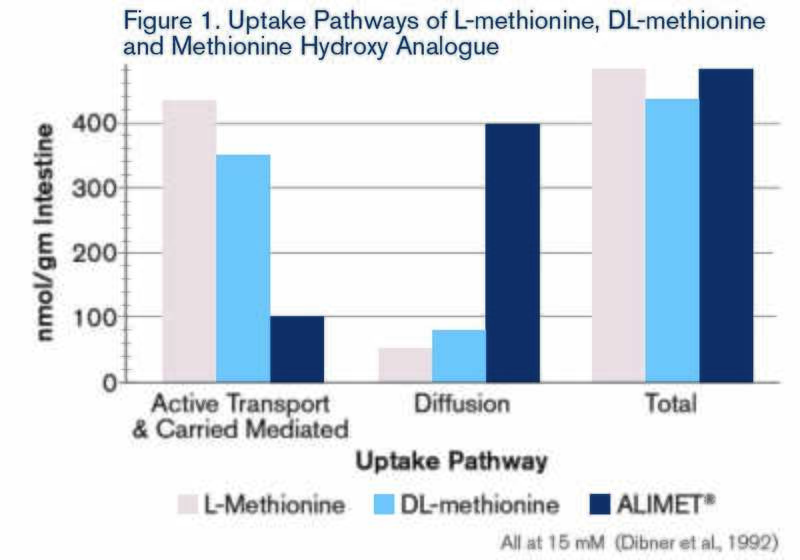 Once ingested by the animal, both D- and L-methionine are transported across the intestinal wall primarily via active and carrier-mediated transport, using Energy and Sodium-Dependent Transporters and Energy and Sodium-Independent Transporters. (Figure 1; Knight et al., 1994). Once absorbed, L-methionine is directly incorporated into protein. The D-methionine is converted into L-methionine in a two-step process. During the first step, an amino acid oxidase removes the amine group to form the α-keto-methionine intermediate metabolite. Following that, a transaminase attaches an amine group to form L-methionine (Figure 2). Conversely, the D- and L-isomers of methionine hydroxy analogue are transported across the animal’s intestinal wall mainly by diffusion (Figure 1; Knight et al., 1994). Once absorbed, the analogue also undergoes a two-step process to be converted into L-methionine. In the first step, the enzymes hydroxy acid dehydrogenase (for the d-methionine of the analogue) and hydroxy acid oxidase (for the l-methionine of the analogue) convert the hydroxyl group into a keto group, forming α-keto-methionine. A transaminase then attaches to an amine group to form L-methionine (Figure 2). The L-methionine molecules derived from D-methionine or methionine hydroxy analogue can then be used by the animal to build protein. In high temperature environments where animals can suffer from heat stress, intestinal absorption capacity changes in the animal. Absorption is shifted from energy and sodium dependent to independent pathways (Knight et al., 1994), whereas diffusion remains unaffected during periods of heat stress. As a result, during heat stress, D-methionine uptake in the intestine is reduced because it cannot compete effectively for the energy and sodium independent absorption pathways. L-methionine is able to be absorbed through the energy and sodium independent pathways during heat stress (Knight et al., 1994). Because energy and sodium independent absorption pathways and diffusion are not reduced during heat stress, L-methionine and methionine hydroxy analogue experience normal uptake. D-methionine suffers an additional disadvantage during heat stress. 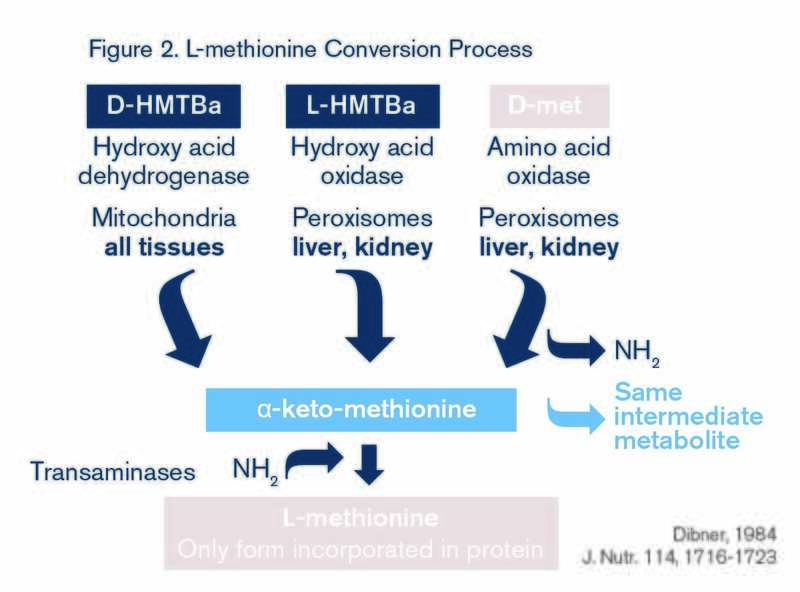 The conversion of D-methionine into α-keto-methionine has an additional energy cost associated with the deamination process (Dibner, 1984). In high temperature environments, the conversion of D-methionine into L-methionine adds energy cost to the already energy-taxed animal. Because of the uptake and conversion limitations of D-methionine during heat stress, DL-methionine does not provide a linear growth response as supplementation increases. Conversely, methionine hydroxy analogue does provide a linear growth response (Knight et al., 1994). Because methionine hydroxy analogue has a hydroxyl group instead of an amine group, it is an organic acid. Its chemical properties as an organic acid allow it to offer multiple benefits to the animal that D-methionine and L-methionine cannot offer as amino acids. Swennen et al., (2011) and Kaewtapee et al., (2010) have shown that methionine hydroxy analogue provides acidifying effects of organic acids. These acidifying effects provide gut health advantages to the animal. Methionine hydroxy analogue has also been shown to reduce nitrogen excretions (Kim et al., 2014), support performance during heat stress (Knight and Dibner, 1984; Dibner et al., 1992) and offer antioxidant capacity (Li et al., 2014; Willemsen et al., 2011; Kuang et al., 2012; Feng et al., 2011). These additional characteristics help producers maximize animal performance in the field.